In 'Get Out,' Jordan Peele Tackles The 'Human Horror' Of Racial Fear Jordan Peele discusses his new film in which he addresses the politics of race. It's about an African-American man meeting his white girlfriend's family for the first time and the horror that ensues. Writer/director/producer Jordan Peele on the set of Universal Pictures' Get Out. 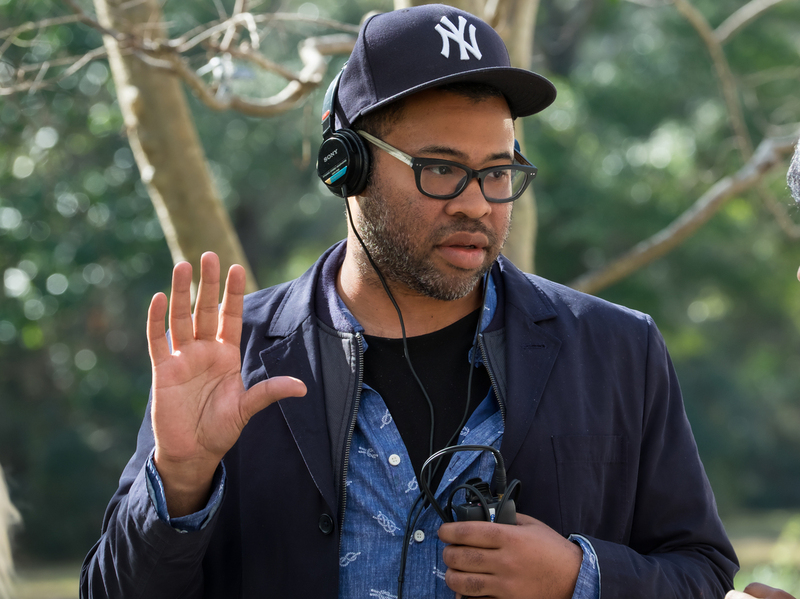 Now Peele has taken that strategy and used it in his directorial debut of a horror film called Get Out. The movie, which he also wrote and produced, is already being called a bombshell social critique, fearless and a must-see, after its first showing at the Sundance Film Festival. In Get Out, Peele unabashedly addresses the politics of racism as he chronicles the story of an African-American man who's meeting his white girlfriend's parents for the first time but she's not told them he's black. NPR's Michel Martin spoke with Peele ahead of the movie hitting theaters on Friday Feb. 24 and he explained the motivation behind tackling this particular issue. This is the only woke horror movie of all time, save for Night of the Living Dead. ... I felt like race has not been dealt with in my favorite genre which is horror. Every other human horror has its sort of classic horror movie to go along with it. So I kind of wanted to fill the gap in that piece of the genre of conversation. Obviously the tone of this movie was a big question mark and we had to get it right because it is dealing with subject matter. It hits home to a lot of people. But I wanted to represent the fact that what many people may not understand is the fear that a black man has walking in a white suburb at night is real. And I wanted to put the audience in that position so they could see it and feel it. I took a lot of cues from Guess Who's Coming to Dinner. The first act of the film kind of resembles that movie. And one of the reasons that movie I think was so successful and important was because you know, aside from being a racial commentary, anybody can relate to the fear of meeting your potential future in-laws for the first time. It's a very scary thing and you want to present yourself right. But when you add race to that equation there is this fear if they don't know that I'm black for example, I don't want to see them realize, "Oh, this is not what I had expected." So in this movie, the parents are very welcoming. They don't skip a beat. They don't care about the color of his skin, which to me was like almost creepier because of what we know this world to be. I think you're really talking about the party sequence. Chris arrives at this party, which is populated with Rose's grandfather's friends — all of whom are white. Everybody wants to connect with him. Everybody wants to say, "Hey, you know, I know Tiger Woods," or feel his muscles. It's all a form of the very true cliché of, "Can I touch your hair?" My wife Chelsea Peretti is, of course, white and I did write this movie before I met her. Without taking it that literal, this is about the African-American experience. It's about the feelings of being an outsider, of being the other that we confront. And also, the presumptions that I make as a black man about others. Well they're pretty they're pretty cultured people. ... My in-laws are amazing people, very intelligent, very warm, very empathetic. I think one of the big problems with how we talk about race though is us versus them. They're racist. I'm not. This movie is not about this idea that white people are racist and no one else is or that white people are villains. We all have issues to deal with in regards to race internally. Part of being a human being unfortunately, is the urge to prejudge people. So I think the only way we can really approach this is to say look this is a human trait and it's how we as individuals choose to deal with our own internal racism and face it that's our only way out. From left to right: Missy (Catherine Keener), Dean (Bradley Whitford), Rose (Allison Williams), Georgina (Betty Gabriel) and Chris (Daniel Kaluuya) in Universal Pictures' Get Out, a speculative thriller written, produced and directed by Jordan Peele.